Today is the big day. Nicole and I came to China for the wedding of our friend, Lilian. Since Lilian’s house is deep in the forest of Qiandao Hu, we had to wake up early for Whitney to pick us up at 6:10am. Whitney and her husband picked us up and drove on to the hotel where Lilian’s friend were staying to lead them to Lilian’s place too. The two cars then went to another place to follow the wedding car’s way to the Place Deep in the Forest. The journey to Lilian’s place took about 2 hours. We passed by the beautiful lakeside of Qiandao Hu (Thousand-Island Lake) and the green mountain side as well as the dusty roads that were being fixed. The view while driving was better than what we saw on the tour of the Qiandao Hu two days ago. Finally we reached Lilian’s place, located deep inside the mountains. There was a slope before her house. When we got there, the beginning of the slope was covered with red strips from firecrackers. Her family would release a lot more firecrackers and fireworks. Lilian was still getting ready when we got there. Since the makeup person arrived with our group of cars, the bride was still not yet made up. While they did her dress and make up, we walked around the village. The groom’s entourage arrived at about 10:30am. As with the customs in Malaysia and Singapore, the bride’s army of busybody ladies (I say this fondly since I was among one of them) had different levels for the groom to pass before he reaches the bride. Here, the levels weren’t prepared as well since it felt more like free-styling. Still, it was great fun as everyone laughed at the different things the groom had to go through. One of the more memorable level was the groom singing 10 different verses of songs that had the word “Love” in it. I spent the last part of the games outside, waiting for the feast to start. At Lilian’s we had some nibbles and then a full lunch with a table full of food. Later at the groom’s place, there was also tea and a full dinner. That is a great amount of food for this celebration. For nibbles and lunch at Lilian, I sat outside with Whiney and Lilian’s ex-colleagues. During nibble time, sunlight poured strongly, burning the tops of our head and everywhere that wasn’t covered by clothing. We had a break after the small meal. When the lunch feast was served, the sun had moved slightly and we moved our table as well to somewhere shadier. 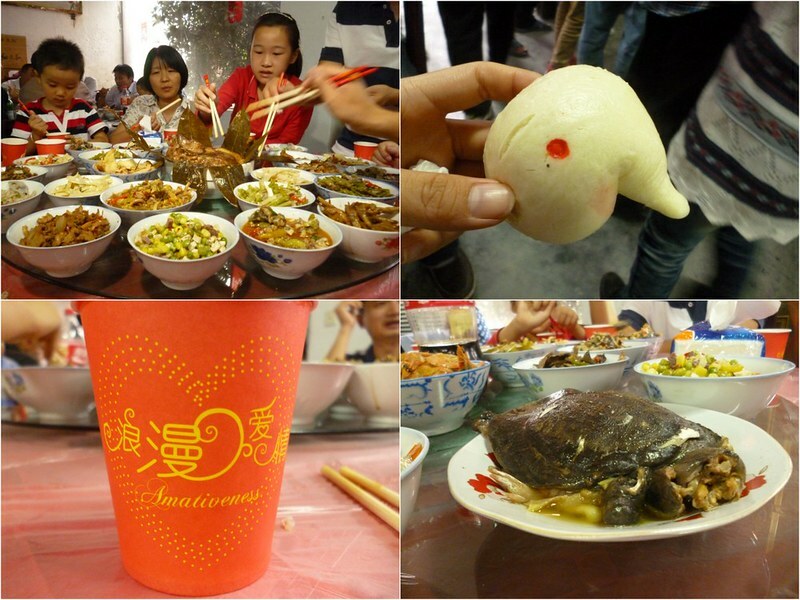 On the table was a bottle of 女儿红, a white liquor used during marriages. I tried a sip of the 42% alcohol drink. It was clear as water and had a sweet fermented taste. But as soon as it reached my mouth, I could feel it evaporate and leaving a tingling burning feeling. Also at the table was a packet of cigarette. Whitney later explained that at weddings, people in China prepare packs of cigarettes. Those who smoked were also pushed single cigarettes as part of the celebration. After lunch, the groom and bride had the usual tea ceremony where they kneel to elders and give the elders dainty cups of tea. I didn’t join in this part as there were too many people around. Soon, the bride left for a quick photoshoot. When all the wedding cars left, the bride’s family let off meters of firecrackers and boxes of fireworks. One of the fireworks even fell onto the bamboo forest and caught fire. Luckily, they were prepared and put out the fire. 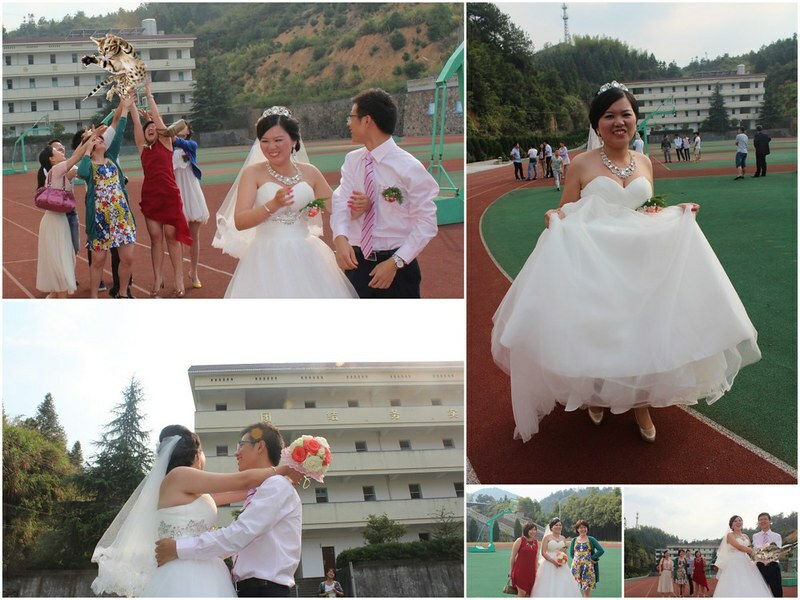 The wedding procession went to the newlywed’s old high school. It was in this high school where the couple met. While the couple took photographs, Nicole and I ventured into the boy’s toilet since the girl’s toilet was locked. It takes a lot to get used to the toilets in China. Since it was an older toilet, there were no doors for the toilets. Actually, there weren’t any toilets but there was a drain. The drain was divided into different chambers with walls up to the knee. When you need to “do business”, you squat so people won’t see your bum. That way, everyone’s honor is kept in tact. Anyway, back to the wedding business. At my request, the bride tossed her bouquet. Neither Nicole nor I managed to catch the flowers but many of the roses spilled out. I did pick up the roses and stuck them back onto their foam base. I wonder if that counts as catching the bouquet in Cupid’s books. After the photoshoot (something different from the Chinese weddings overseas that I’ve been to), we were off to the groom’s place. It was another long drive before we reached there. During dinner feasts at weddings, there is an emcee. There was one here as well. The man had a strange shave, leaving a small plate-shaped on the top of his head. He had a strange goatee that reminded me of old teachers in ancient China. 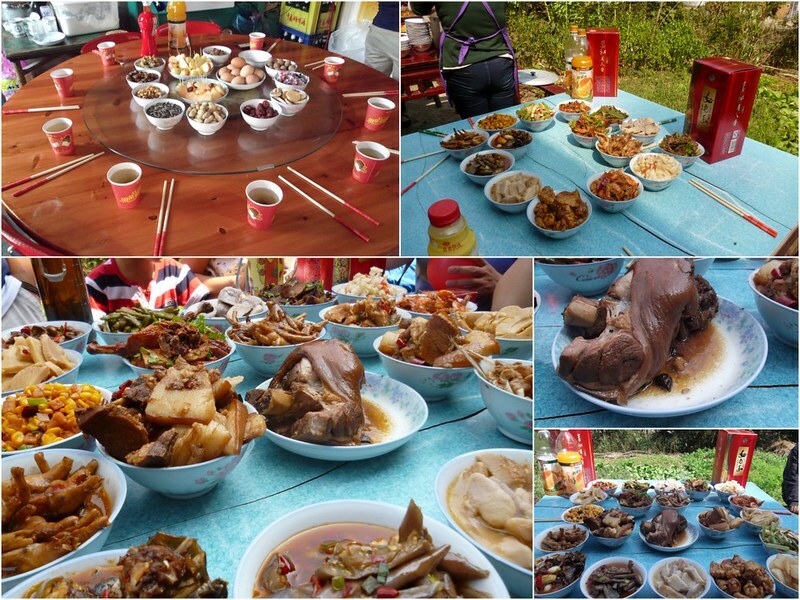 At the beginning of the feast, our tables were heaped with food as well. In fact the lazy susan was filled to its brim with small bowls of yummies. Funnily, we weren’t given bowls but everyone tucked in, nonetheless, and had a grand time. On stage, the emcee humored us all. He also asked the fathers of the newlyweds to give speeches. I admit I got a bit teary then. 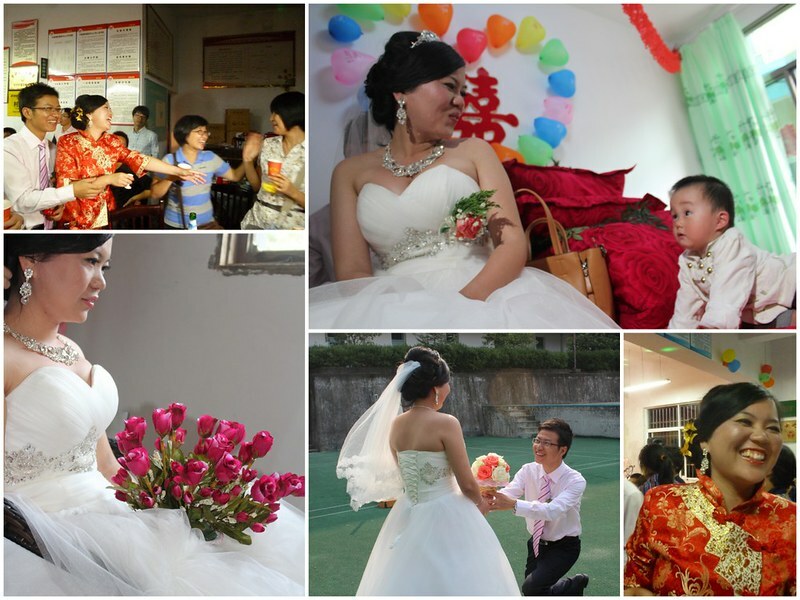 The bride wore a traditional Chinese qipao out. The newlyweds went around to drink with each table. The night ended. We had to wait for Lilian’s uncle to leave before everyone else could. It was the custom of their village. 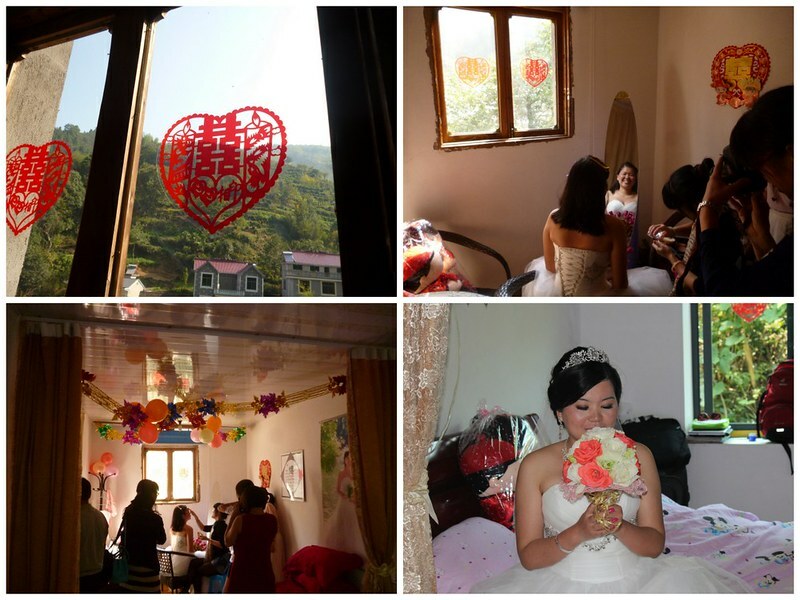 Courtesy of Lilian, Nicole and I were each given a room to stay at the town of Feng Shu Ling. I wrote this while bingeing on anime. 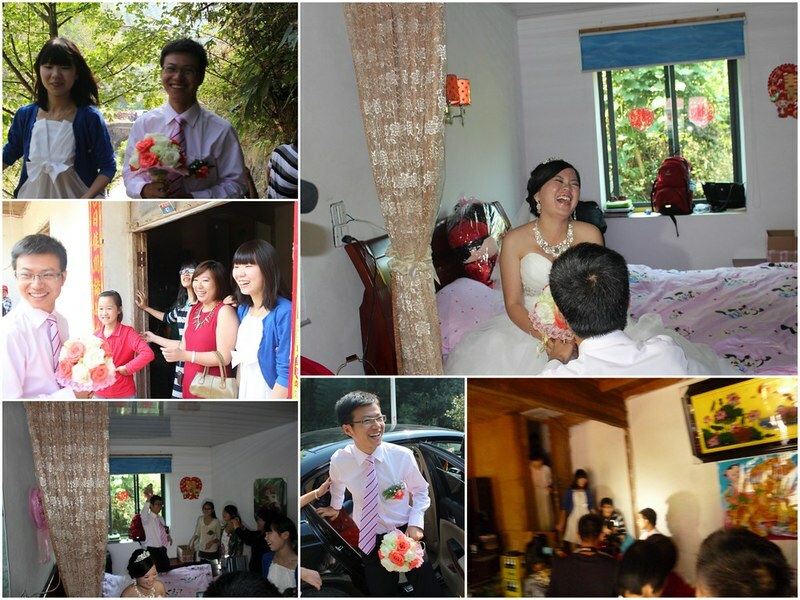 To end this post, let’s toast to Lilian the bride (and her groom Feng Tao too) a Happily Ever After.